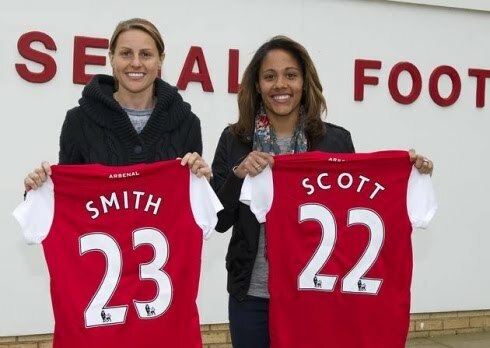 Arsenal and England star Kelly Smith heads a squad of 18 players to represent Team GB. Arsenal and England star Kelly Smith heads a squad of 18 players called up to represent Team GB in the women's Olympic football team. Smith, 33, suffered a broken leg in March and aggravated the injury in May, but England's record goalscorer with 45 goals in 111 caps will now have the chance to represent Britain at the London Games. Arsenal has six players in the 18-women GB squad, while Everton has three representatives. England manager Hope Powell is in charge for the Olympics and the squad draws heavily on the players usually at her disposal, with stars such as Ellen White, Jill Scott and Alex Scott all included. However, Scotland's Kim Little and Ifeoma Dieke have also been included. The British Olympic Association has announced Arsenal midfielder Little and Sweden-based Dieke, who have 160 Scotland caps between them, as part of the squad along with 16 England internationals. With the Scottish FA, along with its Welsh and Northern Irish counterparts expressing concerns over their players taking part under the GB umbrella amid worries over their future international sovereignty, it had been feared only English players would be selected. The SFA and the FAW remain opposed to their players taking part and have repeatedly said so although they have stated that the decision ultimately rests with the players with Wales internationals Gareth Bale and Aaron Ramsey both expected to be part of the men’s squad. Previously, Little’s Arsenal team-mate Julie Fleeting had ruled herself out of playing for Great Britain, claiming she didn’t want to jeopardise the Scottish national team but that has not stopped Little as well as America-born Dieke – although Jenny Beattie, the daughter of the former Scotland and British Lions rugby star, John, had been tipped for selection. “Narrowing my squad down to 18 was very, very tough because of the calibre of player we’ve got coming through now,” said Powell, who has picked Scotland’s Jane Ross and Northern Ireland’s Emma Higgins among four reserves. “But we were very extensive in our scouting and our research and I believe we have got an excellent squad in terms of quality, balance and strength in depth. They are all current internationals with plenty of experience. Reserve list: Jess Clarke (Lincoln), Emma Higgins (Reykjavik), Jane Ross (Glasgow City), Dunia Susi (Chelsea).